There’s no such thing as Free Cheese except when it comes to Big Government. Cheesetown, Pennsylvania – In its infinite wisdom, the U.S. Government is now offering free cheese to almost anyone willing and able to eat it. The Affordable Cheese Act was passed by Congress in the dead of night so that we could read what the new law actually said. The ACA “shall provide free cheese to anyone who voted Democrat in the last election”. 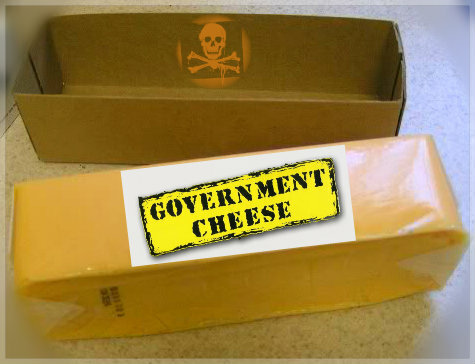 The U.S. taxpayers have already been taxed quite heavily so that this over-abundance of low-grade governmental cheese can now be offered freely to those who may want free cheese from the government. Federal ACA officials will be offering free demonstrations on how to cut the cheese, and then how to use it to make some basic All-American healthy recipes such as: double grilled cheese sandwitches, macaroni and cheese casserole hotdish, and very deep-fried cheese curds. To get your free Government Cheese, simply stand in line wherever free governmental handouts are normally offered and use promo-code “FGC-2017” when filling out the mandatory 12-page IRS tax form #C-1270-BO.